When you fry at home, you can do things the right way: start with clean oil, heat it to the right temperature, and then throw it out when it’s done. When you go to a fast-food place, that oil has sat there all day (if not all week)…it’s been used hundreds of times…it absorbs the flavors of whatever was fried before your food got dropped in there…and quite frankly, it’s beat up. 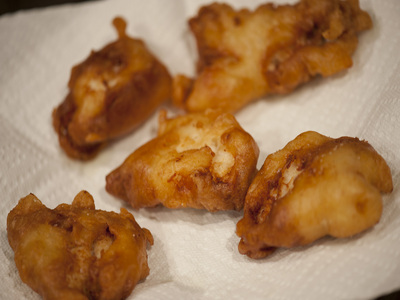 What got me started with this whole beer-batter-at-home process was stumbling upon some fresh local cod at my neighborhood seafood store: Bridgeport Seafood in Tiverton, Rhode Island. My buddy, Dave, said that the cod came from just off Sakonnet Point that day. Good enough for me! I always try to fry with healthy oils. For me, that means olive oil, avocado oil, or, pork lard from heritage breed pigs. But none of those choices are cheap. So I allow myself to “cheat” when deep-frying and I use peanut oil or vegetable oil. Using a thermometer, I heat it to 350 degrees. I always watch the temp of my oil…it can get too hot very quickly…and by the same token, the temp can drop quickly if I throw in a whole bunch of fish into the pot all at once. Using one of those deep fryers made for home use is also a good way of cooking and controlling temperature. I’m careful not to put too much oil in my pot (halfway up is fine) or it could spill over, since oil expands as it gets hotter. Combine all the ingredients in a bowl and beat until smooth. Cover loosely with plastic wrap and place in the fridge for 3 hours. Cut your fish into pieces that aren’t too big and will fit in your pot easily. The thickness of the fish may vary and so may the cooking times of each piece. When the oil reaches 350, simply dip the fish into the batter and let as much batter drip off as you like before you carefully place the fish into the oil. Fry until golden brown. What good is fried fish without tartare sauce, right? Don’t tell me you’re using the stuff in a jar after frying the fish yourself! Combine all the ingredients in a bowl, cover with plastic and refrigerate for an hour before using. To make beer-batter gluten-free, substitute GF flour for the all-purpose flour. (I like Cup4Cup.) And now, you can get gluten-free beer that tastes pretty damn good. Use it instead of regular beer, and you’ve got a beer batter that’s gluten-free! April 7 is National Beer Day! When you fry at home, you can do things the right way: start with clean oil, heat it to the right temperature, and then throw it out when it’s done. When you go to a fast-food place, that oil has been sitting there all day (if not all week)…it’s been used hundreds of times…it absorbs the flavors of whatever was fried before your food got dropped in there…and quite frankly, it’s beat up. What got me started with this whole beer-batter-at-home process was stumbling upon some amazing fresh local cod at my neighborhood seafood store: Bridgeport Seafood in Tiverton, Rhode Island. My buddy, Dave, said that the cod came from just off Sakonnet Point that day. Good enough for me! I use vegetable oil and, using a thermometer, heat it to 350 degrees. I always watch the temp of my oil…it can get too hot very quickly…and by the same token, the temp can drop quickly if I throw in a whole bunch of fish into the pot all at once. Using one of those deep fryers made for home use is also a good way of cooking and controlling temperature. I’m careful not to put too much oil in my pot (halfway up is fine) or it could spill over, since oil expands as it gets hotter. To make beer-batter gluten-free, simply substitute GF flour for the all-purpose flour. (I like Cup4Cup.) And now, you can get gluten-free beer that tastes pretty damn good. Use it instead of regular beer, and you’ve got a beer batter that’s gluten-free! Fried food has not had a good reputation. Everyone automatically thinks that it’s bad for you. That fact is, if it’s done right, fried food is delicious and not greasy at all. Combine all ingredients in a bowl and beat until smooth. Cover loosely with plastic wrap and place in fridge for 3 hours. Cut your fish into pieces that aren’t too big and will fit in your pot easily. Thickness of the fish may vary and so may the cooking times of each piece. When the oil reaches 350, simply dip the fish into the batter and let as much batter drip off as you like before you carefully place the fish into the oil. Fry until golden brown. Combine all ingredients in a bowl, cover with plastic and refrigerate for an hour before using.